Sunshine Educare was founded in Skandaalkamp settlement, an informal “bush” settlement located on the Frankdale Waste disposal site just off the N7 outside Tableview. this amazing facility which is an oasis of light in a place of darkness. It offers hope in a place that has none and a future in a place where no-one lives, everyone merely survives. The school originally started off in a desperately undersized shack with one tiny window where 70 children from 1 to 8 were huddled in one shared room. Soon, with the help of SAVE Foundation, we acquired a wendy house which allowed us to take the older kids out in a group to do educational activities while the babies and toddlers played. By January 2014 we moved across to a cleared piece of land where SAVE and KILROY erected two beautiful classrooms. With lots of fundraising we managed to fence the school, build a cement pathway for the scooter bikes and plant grass for the little feet. 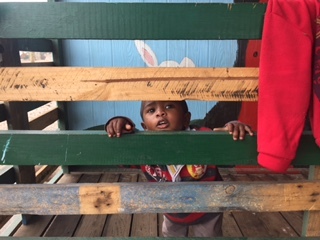 As Skandaalkamp didn’t have any formal garbage removal, the entire settlement is riddled with burnt remains of shacks, broken glass, waste and many things that are NOT good for little feet. We wanted a safe place where the children could (for the first time in their lives) run barefoot without the fear and risk of broken glass and other hazards. The preschool stands out like a ray of light in a place of darkness – from the green lawn contrasted against the filthy soil of the settlement to the brightly coloured buildings contrasted against makeshift shacks erected using only scrap material. By the end of 2014, KILROY and SAVE generously added an additional 3 buildings. Two as new classrooms and 1 as a new restroom building where for the first time, the children can practice proper hygiene with toilets, hand basins and hand soap available at all times. The school also serves as a “community centre” and is used as a meeting place for community meetings, or meetings with external parties such as social workers, the local government, etc. It has become a symbol of hope and possibilities. In June 2015 the community of Skandaalkamp, along with 6 other settlements were moved by the city of Cape Town to an even more remote location called Wolwerivier. Sunshine Educare moved across with the communities and re-opened its doors in August 2015. Since then, our numbers have doubled with all the new children. We are still the only facility in the area and the community are even more reliant on our assistance than before. Poverty has worsened due to a larger number of residents, reduced public transport and loss of the only form of income the residents had – they used to survive by scavenging the local dumpsite but are no longer able to recycle scrap metals and other resources for money. They now also have tiny houses and no space for vegetable farming – something that used to be the major source of food in the old area. In August 2016, Nikki Pretorius was kindly sponsored a course by Ambutek training centre as a basic ambulance assistant (level 5 first aid) and is using that knowledge to see to the basic medical needs of this community who is now even further from any medical facilities. We hope to open our Rainbow Response first aid station by October 2016. Error: Error validating access token: Session has expired on Thursday, 04-Apr-19 10:42:30 PDT. The current time is Tuesday, 23-Apr-19 15:14:28 PDT.